What happens in Europe doesn’t stay in Europe. In Market Strategy commentary today, Joe Quinlan, Head of CIO Market Strategy for Merrill and Bank of America Private Bank, discusses why Europe is hugely important to the overall and long-term success of many U.S. multinationals, and by extension, the U.S. economy. He says, of the 200 economies that make up the global economy, the “Big Three” – United States, China and Europe – account for 60% of world GDP and global consumption, and 55% of world trade and cross-border investment. With or without the UK, the EU is a formidable economic entity. Minus the UK, the EU’s output was still almost 20% larger than China’s last year. While much has been given to the rise of the middle class consumer in China and associated market opportunities, China remains a difficult place to do business. U.S. affiliate firms doing business there posted just $13.3 billion in earnings in China, down 1.1% from the year prior. Meanwhile, U.S. corporate earnings in Europe hit a record $284 billion last year, up 7%. Europe remains, by far, the most important market for U.S. multinational companies. As the UK and EU struggle to find a solution on Brexit, and as political populism gains traction across the continent, at risk are large-cap U.S. corporate earnings. Joe’s full report with supporting charts can be found below. The first chart shows the relative strength of the world’s Big Three economies, separately and combined. The world economy is composed of nearly 200 economies but only three can significantly move the needle when it comes to global growth, trade, investment and related activities: the United States, China and the EU. The rest of the world follows along. The “Big Three” account for over 60% of world gross domestic product (GDP) and global consumption, and more than half of world trade and cross-border investment (Exhibit 1). With or without the UK, the EU is a formidable economic entity, with output totaling over $18 trillion in 2018. Minus the UK, the EU’s output ($16 trillion) was still almost 20% larger than China’s ($13.5 trillion) last year, underscoring the economic heft of the region. Add in the bloc’s 500 million people with a healthy per capita GDP of $34,000, and Europe’s influence on global economic activity and global earnings becomes even clearer. To this point, recall that it was Europe that was at the forefront of the global economic slowdown of 2018. As Exhibit 2 highlights, the region’s Purchasing Managers Index (PMI) peaked in January 2018, and economic growth was subsequently dragged lower by a stronger euro, rising oil prices and industrial capacity constraints. Accelerating the move to the downside: the announcement of U.S. steel and aluminum tariffs in March 2018, which battered business confidence in Europe and disrupted transatlantic trade volumes. Over the second half of the year, rising U.S.-China trade tensions—and the attendant negative effect on China’s real growth—squeezed EU exports to China in particular and the world in general. More EU exporters have greater leverage to China today than the U.S., so when China sneezes, Europe catches a cold, notably those nations with a relatively high share of exports to GDP (e.g., Germany, the Netherlands, Belgium, and Ireland). 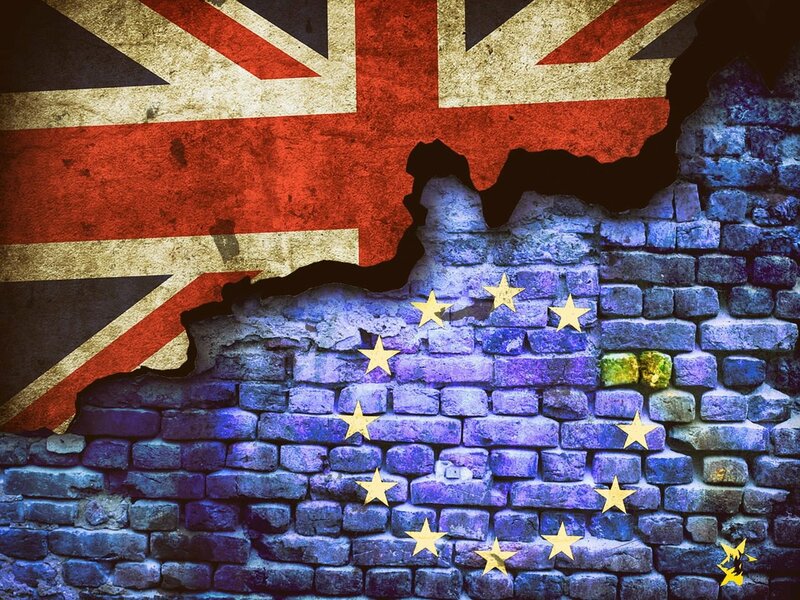 In addition to softening external demand, the messy uncertainty of Brexit has hardly helped matters, sapping consumer and business confidence on both sides of the Channel. Against this backdrop, Europe limped into 2019. Euro area growth forecasts have been continuously marked down over the past few months, with the Organisation for Economic Co-operation and Development (OECD), for instance, now forecasting euro area real growth of just 1% this year versus 1.8% back in November 2018. The outlook for growth next year is hardly gangbusters: 1.2%. That’s the bad news. The good news: A great deal of negative news is already priced into European equities. What’s more, the reflationary policies of both the U.S. (aka, Fed on hold) and China (more pro-cyclical spending) should likely limit the economic downside in Europe in the next few months, as should more accommodating policies from the European Central Bank (ECB) and mild stimulative fiscal positions of most euro states. Add in a U.S.-China trade deal that dramatically de-escalates global trade tensions and the economy most dependent on trade for growth—the European Union—looks better. This backdrop is why European large cap equities have been among the best performers so far this year (Exhibit 3). The buoyancy of Europe equities reflects market expectations that the U.S. and China could likely successfully reflate global growth, with export-dependent eurozone nations among the main beneficiaries. One caveat: the UK crashing out of the EU, which cannot be ruled out at this juncture. The OECD estimates that should the two parties separate without a deal—boosting tariffs between the two parties—the effect would reduce GDP by around 2% in the UK over the next two years.21 The negative spillover effects would hurt smaller European exporters most exposed to the UK, notably Ireland, the Netherlands and Denmark. We believe the U.S. economy is the most resilient and dynamic of the “Big Three”—or the United States, China and the European Union. But the United States is hardly immune to troubles across the Atlantic. As we have highlighted in the past, Europe matters significantly to U.S. corporate earnings. For instance, data released last week from the Bureau of Economic Analysis show that U.S. corporate earnings in Europe hit a record $284 billion in 2018, up 7% from a year ago. Putting that number into perspective, U.S. affiliate income in Europe was about three times more than the affiliate income of all of Latin America ($96 billion) or Asia ($93 billion). Europe remains, by far, the most important market for U.S. multinational companies, with the region as a whole accounting for 55% of global foreign affiliate income. Wealthy consumers, respect for the rule of law, the ease of doing business, credible institutions—all of these factors, and more, have long made the EU a more attractive place to do business for American firms. While much attention has been given to the rise of the middle class consumer in China and associated market opportunities, the country remains a difficult place to do business. U.S. affiliates posted just $13.3 billion in earnings in China in 2018, down 1.1% from a year ago. Meanwhile, the more profitable U.S. affiliates are in Europe, the more earnings are available to the parent firm to hire and invest at home, dole out higher wages to U.S. workers, and/ or increase dividends to U.S. shareholders. In other words, U.S. corporate success in Europe is hugely important to the overall and long-term success of many U.S. multinationals, and by extension, the U.S. economy. The more successful U.S. affiliates are in reaching new consumers in Europe and leveraging the Continent’s resources, the better off are the foreign affiliates, U.S. parent companies, U.S. workers, shareholders and local communities are considered. In other words, America’s transatlantic partnership with Europe has proven to display significant dividends. Despite a more challenging economic environment in Europe last year, U.S. foreign affiliate profit growth remained strong. However, rising investment uncertainty and structural issues throughout Europe could lead to a more challenging operating environment for U.S. multinationals, which have long counted on Europe to drive the bulk of their non-U.S. earnings growth. In the end, the future of the EU remains critical to the long-term health of the global economy. In other words, what happens in Europe doesn’t stay in Europe. As growth slows in the eurozone, as the UK and EU struggle to find a solution on Brexit, and as political populism gains traction across the continent, at risk are large-cap U.S. corporate earnings. However, global reflationary policies are falling into place that should help to limit the profits downside to U.S. firms. The named research analysts in these materials certify that: the views expressed in these materials accurately reflect the analysts’ personal opinions about the securities, investments and/or economic subjects discussed and that no part of the analysts’ compensation was is or will be related to any specific views contained in these materials. This publication is designed to provide general information about economics, asset classes and strategies. It is for discussion purposes only since the availability and effectiveness of any strategy is dependent upon your individual facts and circumstances. Always consult with your independent attorney, tax advisor, and investment manager for final recommendations and before changing or implementing any financial strategy. The information contained herein has been obtained from sources believed to be reliable, but we cannot guarantee its accuracy or completeness. Opinions and estimates expressed herein are as of the date of the report and are subject to change without notice at any time. Equities: Investments in equities are subject to the risks of fluctuating stock prices, which can generate investment losses. Equities have historically been more volatile than alternatives such as fixed income securities. Fixed income securities: Fixed income investments fluctuate in value in response to changes in interest rates. Mortgage-backed securities are subject to credit risk and the risk that the mortgages will be prepaid, so that portfolio management may be faced with replenishing the portfolio in a possibly disadvantageous interest rate environment. Commodities: Commodities investments are highly volatile and are speculative. Commodities prices may be affected by overall market movements, changes in interest rates, and other factors such as weather, disease, embargoes, and international political and economic developments. Alternative Investments such as derivatives, hedge funds, private equity funds, and funds of funds can result in higher return potential but also higher loss potential. Changes in economic conditions or other circumstances may adversely affect your investments. Before you invest in alternative investments, you should consider your overall financial situation, how much money you have to invest, your need for liquidity, and your tolerance for risk. This report is solely for informational purposes and does not purport to address the financial objectives, situation or specific needs of any individual reader. Neither the information nor any opinion expressed constitutes a solicitation for the purchase or sale of any security. These comments are not necessarily representative of the opinions and views of portfolio managers or of the firm as a whole. Past performance is not a guarantee of future results. U.S. Trust, Bank of America Private Wealth Management operates through Bank of America, N.A. and other subsidiaries of Bank of America Corporation. Bank of America N.A., Member FDIC.